Big East Lake is the largest and most popular of the Payson Lakes. 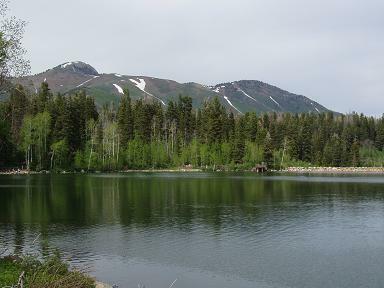 Payson Lakes are location at the south end of Utah Valley in Payson Canyon. Payson Lakes are set in a beautiful area between Mt. Loafer and Mt. Nebo. The shoreline is owned 100% by the Uinta National Forest, and public accessibility is unrestricted. They hold a population of brook trout that are stocked periodically as fingerlings, as well as rainbow trout that are stocked often as catchable sized fish. Payson Lakes are very popular summer destinations for swimming, canoeing, fishing and camping. There is a campground right on one of the lakes, and only a couple miles away is the Blackhawk Campground as well. Access is usually closed until around Memorial Day every year due to the snowpack that usually doesn't melt until then. Payson Lakes include many facilities, including improved campgrounds, which cost $11 per night, and allow certain sites to be reserved in advance, and others are "first come first serve". There is also a beach area on the lake where	kids can swim and play in shallow water with a sandy bottom. There is a pier where wheelchair access is available to fish from. However, at times, kids like to use the peer as a diving board to jump into the water and swim. Fishing at Payson Lakes is best done in the early morning or in the evening. Fish can be caught with traditional trout baits and lures, including powerbait or worm and a marshmallow for bait, or spinners or flies for artificial lures. For best results, get away from the crowds and especially away from the swimmers and loud play areas. For more information on Big East Lake (Payson Lakes) from the Utah state government, click here.